This month, we're discussing Queenpin by Megan Abbott. Megan Abbott will sign and discuss The Fever Dare Me (Little, Brown; $26.00). Megan Abbott is the Edgar®-winning author of the novels Queenpin, The Song Is You, Die a Little, and Bury Me Deep. Her latest novel, The end of everything, is a crime novel set in suburban Michigan, which made the Best Books of the Year Lists for publications including Publisher's Weekly, the Boston Globe, Baltimore City Paper and the Washington Examiner. Her writing has appeared in the New York Times, Salon, the Los Angeles Times Magazine, The Believer, Los Angeles Review of Books, Detroit Noir, Best Crime and Mystery Stories of the Year, Storyglossia, Queens Noir and The Speed Chronicles. Born in the Detroit area, she graduated from the University of Michigan and received her Ph.D. in English and American literature from New York University. She has taught at NYU, the State University of New York and the New School University. This year, she is teaching at the Crime Fiction Academy at New York City's Center for Fiction. She is also the author of a nonfiction book, The Street Was Mine: White Masculinity in Hardboiled Fiction and Film Noir, and the editor of A Hell of a Woman, an anthology of female crime fiction. She has been nominated for many awards, including three Edgar® Awards, Hammett Prize, the Macavity, Anthony and Barry Awards, the Los Angeles Times Book Prize and the Pushcart Prize. Vicki Pettersson will sign and discuss The Given (Harper Voyager; $14.99), the third book in the Celestial Blues Series. The New York Times bestselling author of The Signs of the Zodiac series–and former showgirl–Vicki Pettersson was born, raised, and still lives in Sin City, where a backyard view of the Strip regularly inspires her to set down her martini and write. Alison Gaylin will sign and discuss Stay With Me (Harper; $5.99) PBO. Alison Gaylin is the author of Into the Dark, the Shamus Award-winning And She Was, the Edgar(R)-nominated thriller Hide Your Eyes, as well as its sequel, You Kill Me, and two stand-alone novels, Trashed and Heartless. A graduate of Northwestern University and Columbia University's Graduate School of Journalism, Alison lives with her husband and daughter in upstate New York. After a ten year career as a prosecutor for the L.A. District Attorney's office, where she handled such high profile cases as the O.J. Simpson trial, Marcia Clark turned her shrewd legal mind to the crafting of such thrillers as Guilt by association and Killer Ambition. Reed Farrel Coleman is a three-time winner of the Shamus Award for Best Detective Novel and the author of the Moe Prager mystery series. His highly anticipated finale in the series is "The Hollow Girl." Megan Abbott is the bestselling author of the novels The End of Everything and Dare me. Her latest novel is The Fever" an unsettling thriller about a mysterious contagion affecting the teenagers of an idyllic suburban community. #1 bestselling crime writer Ridley Pearson continues his international thrill-ride Risk Agent series. In "The Red Room," Grace and Knox go undercover to infiltrate a deadly spy ring and begin questioning their loyalties. A world championship boxing official, Tom Schreck brings personal experience to his critically acclaimed novels starring a professional fighter. His latest thrillers are Getting Dunn and On the Ropes. “Lush, dark and unsettling, No book but the world haunted me for days. With great skill, Leah Hager Cohen takes us through a twisty and resonant tale about the price of secrets, the burden of family, the remnants of childhood we never leave behind.” Megan Abbott, author of The end of everything and Dare me At the edge of a woods, on the grounds of a defunct “free school,” Ava and her brother, Fred, shared a dreamy and seemingly idyllic childhood—a world defined largely by their imaginations and each other’s presence. Everyone is aware of Fred’s oddness or vague impairment, but his parents’ fierce disapproval of labels keeps him free of evaluation or intervention, and constantly at Ava’s side. Decades later, then, when Ava learns that her brother is being held in a county jail for a shocking crime, she is frantic to piece together what actually happened. A boy is dead. But could Fred really have done what he is accused of? As she is drawn deeper into the details of the crime, Ava becomes obsessed with learning the truth, convinced that she and she alone will be able to reach her brother and explain him—and his innocence—to the world. Leah Hager Cohen brings her trademark intelligence to a psychologically gripping, richly ambiguous story that suggests we may ultimately understand one another best not with facts alone, but through our imaginations. 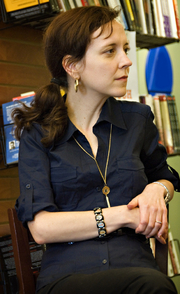 Leah Hager Cohen is the author of four previous novels, most recently The grief of others, which was long-listed for the Orange Prize, selected as a New York Times Notable Book, and named one of the best books of the year by the San Francisco Chronicle, Kirkus Reviews, and The Globe and Mail. She is also the author of five nonfiction titles, including Train Go Sorry and the forthcoming I Don’t Know. She is a frequent contributor to The New York Times Book Review. Edgar-award winning crime fiction writer Megan Abbott is our John Grisham writer in residence. Don’t miss this opportunity to hear her read and meet her while she’s in town! Megan Abbott is the Edgar®-winning author of the novels Queenpin, The Song Is You, Die a Little, Bury Me Deep, and The end of everything. Her latest novel, href="/work/12191416">Dare me, was chosen by Entertainment Weekly as one of the Best Books of 2012 and is soon to be a major motion picture. Born in the Detroit area, she graduated from the University of Michigan and received her Ph.D. in English and American literature from New York University. She has taught at NYU, the State University of New York and the New School University. In 2013, she will serve as the John Grisham Writer in Residence at Ole Miss. Mystery Book Group Open to the Community Wednesday, August 28 at 7:00 p.m. Beth will be discussing Megan Abbott's novel, The end of everything. Join us for an evening with five outstanding mystery and suspense writers who will each read from recent work and discuss their craft. This event brings together top writers from across the country, including Michael Koryta (The Prophet), Ace Atkins (Wonderland), Reed Farrel Coleman (Onion Street), Megan Abbott (Dare me), and Hank Phillippi Ryan (The Other Woman). Megan Abbott is a LibraryThing Author, an author who lists their personal library on LibraryThing. Megan Abbott's book Mississippi Noir was available from LibraryThing Early Reviewers. Megan Abbott's book The Fever was available from LibraryThing Early Reviewers. Megan Abbott's book USA Noir was available from LibraryThing Early Reviewers. Megan Abbott's book The End of Everything was available from LibraryThing Early Reviewers. Megan Abbott is currently considered a "single author." If one or more works are by a distinct, homonymous authors, go ahead and split the author. Megan Abbott is composed of 5 names. You can examine and separate out names.